Its been almost 2 years since I have been an amateur drummer (which apparently is also the time since my last blog) and I have always felt that it would be great to have something that can provide me with drum transcriptions from a given music source. I researched a bit and came across a library that provides an executable as well as an API that can be used to generate drum tabs (consisting of hi-hats, snare and the kick drum) from a music source. Its called ADTLib. This isn’t extremely accurate when one tests it and I’m sure the library will only get better with more data sources available to train the neural networks better but this was a definitely a good place to learn a bit about neural networks and libraries like Tensorflow. This blog post is basically meant serve as my personal notes wrt how Tensorflow has been used in ADTLib. In system_restore() we initialise an instance of SA and call the create() method. There are a lot of parameters that are initialised when we create the neural network graph. We’ll not go into the details of those. Instead let’s look at how Tensorflow is used inside the SA.create() method. I would recommend reading this article on getting started with Tensorflow before going ahead with the next part of this blog post. If you’ve actually gone through that article you’d know by now that Tensorflow creates graphs that implement a series of Tensorflow operations. The operations flow through the units of the graphs called ‘tensors’ and hence the name ‘tensorflow’. Great. So, getting back to the create() method, we find that first a tf.reset_default_graph() is called. This resets the global variables of the graph and clears the default graph stack. self.biases is set to variable with an initial value which is defined by the tensor returned by tf.zeros() (returns a tensor with dimension=2 where all elements are set to 0. self.n_classes is set to 2 in the ADTLib code). self.weights is initialised to a variable defined by the tensor returned by tf.random_normal(). tf.random_normal() returns a tensor of the mentioned shape with random normal values (type float32) with a mean of 0.0 and a standard deviation of 1.0. These weights and biases are trained based on the type of optimisation function later on. In ADTLib no training is actually done wrt to these weights and biases. These parameters are loaded from pre-trained neural networks as I’ve mentioned before. However we need these tensors defined in order to be able to implement the neural network on input music source. Placeholders are used when a graph needs to be provided external inputs. They can be provided values later on. In the above example we define a placeholder that is supposed to hold ‘float32’ values in an array of dimension [1, 1000, 1024]. (Don’t worry about how I arrived at these dimensions. Basically if you check the init() method for class SA, you’ll understand that ‘self.batch’ is structure of dimension [1000, 1024]). Constants as the name suggests hold constant values. In the above example, self.truncated is initialised to 1000. ‘shape’ is an optional paramaters that specifies the dimension of the resulting tensor. Here the dimension is set to . This creates the BRNN with the two types of cells provided as parameters, the input training data, the length of the sequence (which is 1000 in this case) and the data type. self.outputs is a tuple (output_fw, output_bw) containing the forward and the backward RNN output Tensor. We now have the graph that defines how the BRNN should behave. These next few lines of code in the create() method deals with something called as soft-attention. This answer on stack overflow provides an easy introduction to this concept. Check it out if you want to but I’ll not go much into those details. But what happens essentially is that the forward and backward output cells from the second layer are again concatenated and then furthur processed to ultimately get a self.presoft value which resembles (W*x+b) as seen below. Next we come across self.pred=tf.nn.softmax(self.presoft). This basically decides what activation function to use for the output layer. In this case softmax activation function is used. IMO this is a good reference for different kind of activation functions. When this function is executed we get the test results and further processing is done (this process is called peak-picking) to get the onsets data for the different percussive components. I guess that’s it. There are a lot of details that I have omitted from this blog, mostly because it would make the blog way longer. I’d like to thank the author of ADTLib (Carl Southall) who cleared some icky doubts I had wrt to the ADTLib code. There is also a web version of ADTLib that has been developed with an aim to gather more data to train the networks better. So contribute data if you can! I have been working on this project I have named spartakus that deals with kernel ABI checks through semantic processing of the kernel source code. I have made the source code available on Github some time back and this does deserve a blog post. spartakus is a tool that can be used to generate checksums for exported kernel symbols through semantic processing of the source code using sparse. These checksums would constitute the basis for kernel ABI checks, with changes in checksums meaning a change in the kABI. spartakus (which is currently a WIP) is forked from sparse and has been modified to fit the requirements of semantic processing of the kernel source for kernel ABI checks. This adds a new binary ‘check_kabi‘ upon compilation, which can be used during the linux kernel build process to generate the checksums for all the exported symbols. These checksums are stored in Module.symvers file which is generated during the build process if the variable CONFIG_MODVERSIONS is set in the .config file. What purpose does spartakus serve? both declarations are essentially the same and should not result in a change in kABI wrt ‘list_head’. Sparse treats these 2 declarations as semantically the same and different checksums are not generated. 2. For variable declarations with just unsigned/signed specification with no type specified, sparse considers the type as int by default. ‘unsigned foo’ is converted to ‘unsigned int foo’ and then processed to get the corresponding checksum. On the other hand, genksyms would generate different checksums for 2 different definitions which are semantically the same. sparse is licensed under the MIT license which is GPL compatible. The added files as mentioned above are under a GPLv2 license since I have used code from genksyms which is licensed under GPLv2. Development on spartakus is in progress and the corresponding source code is hosted on Github. Lastly, I know there will be at least who will wonder why the name ‘spartakus’. Well I do not totally remember, but it had something to do with sparse and Spartacus. Does sound cool though? Day 0: We (me, sayan, chandankumar, praveenkumar, rtnpro and pjp) reached Durgapur around 5:40 pm and were settled in the hotel in an hour. We took some rest, while waiting for Kushal to arrive after which we had a nice dinner at a local restaurant, called Layeks. We discussed our plans for the next day during and after the dinner. All we could do after a day of journey and a fulfilling dinner was to sleep off. We needed to start early next day. 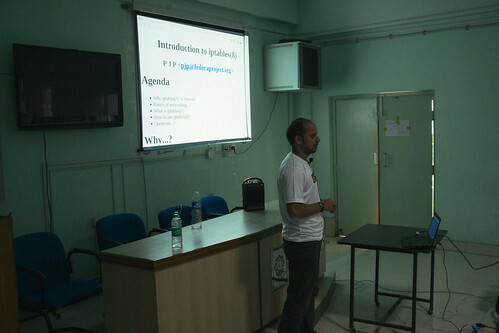 Day 1: After the initial formalities, the event started off with Kushal initiating the talk on the history of DGPLUG. I’m pretty sure the audience really loved that talk. Next there was some story-telling by the DGPLUG members where they spoke of how they were introduced to FOSS contributions, the DGPLUG community and how DGPLUG played an important role in each of our lives. The audience was introduced to the DGPLUG summer training program that is organised each year following which the new members of DGPLUG were called in on stage to introduce themselves and speak on how the DGPLUG summer training helped. After this Kushal demoed IRC live on the big screen which provided the audience with enough entertainment to get them charged up for the technical talk by Prasad J. Pandit (P J P) on iptables. His talk touched on concepts of networking and invited a lot of questions from the audience. The day ended with pjp’s talk and we headed off to our hotels to freshen up for a team dinner. Day 2: This day started with a well-promoted Python workshop, which was evident from the overwhelming participation. The D. M. Sen Auditorium Hall was packed with no seats left. The participants took off to Python really well, and there were comparatively a lot few mistakes from them even though the workshop pace was not too slow. During the course of the workshop, the students were introduced to Vi/Vim and almost all of them used this for editing purposes. We realised that the workshop was a real success when we found the auditorium hall filled to capacity even after an 1-hour break for lunch. Day 3: Workshops were help on web development using Flask and testing in Python. 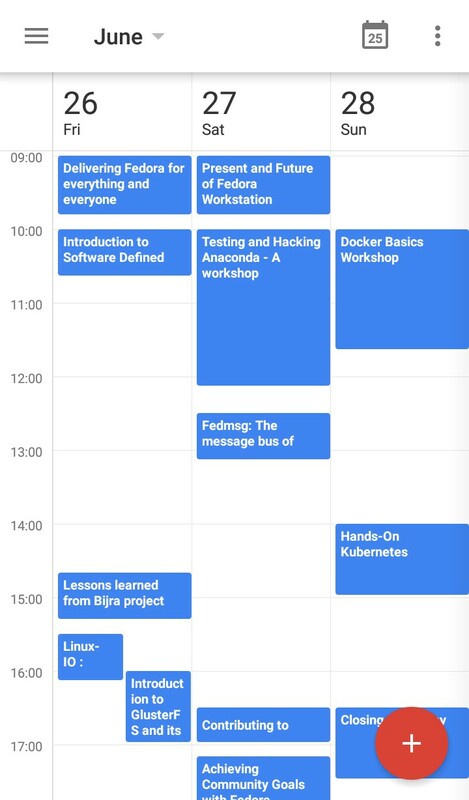 I did not have much to contribute to the workshop on Flask and instead gave some time to my personal agenda which was giving time to the KF5 porting work for KStars that I had been postponding for long. Day 4: This was the last day of the event for me. The day started with Kushal Das giving a short talk on the importance of providing documentation for the code we write. This provided the necessary build up to the workshop introducing the participants to reStructuredText format or RST. By lunch time, the participants had a grasp of the RST format. After lunch, Kushal started off with his workshop on documenting Python using Sphinx. Over these past 4 days, I interacted with 2 guys, Sourav Moitra and Raunak Pillai, both of whom showed a lot of interest in getting started with contributing to KDE. Sourav Moitra was interested in Astronomy and KStars interested him. He got KDE installed on his Fedora 20 system and I helped him build and install KStars from source. He also setup KDevelop with KStars and learned how to to use KDevelop as an IDE for development purposes. He went through the source and asked question to clear off doubts. The event managed to retain a very healthy crowd each day and I consider that an important parameter to measure the success level for an event. 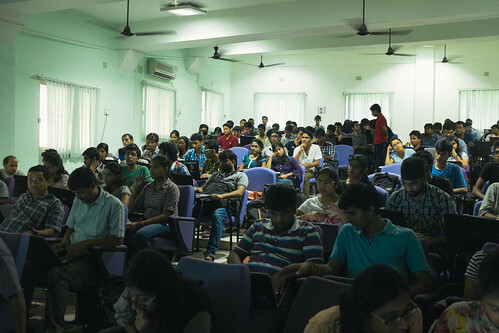 On top of that we received feedback from the participants which made it clear that they wanted more such events being organised in NIT Durgapur and surrounding locations. P.S. : Akademy 2014 is about to start off and I feel so sad not being able to attend it. Anyway, wishing Akademy 2014 all the best and hope all the attendees have an awesome time! KDE‘s Randa Meetings is quite possibly the best large-scale developer sprint ever. And you can help make it happen. Imagine some 40 developers cramped together in a house in the middle of the Alps, living of code alone. Nothing could possibly go wrong…. Phonon, a pillar of our multimedia solutions, was revived in Randa. Kdenlive, our video editor, became 302% more awesome in Randa. The KDE Frameworks 5 movement seeking to make our awesome libraries more useful to all the world started in Randa. Amarok 2 was planned in Randa. Approximately a godzillion bugs were fixed in Randa. Go to ‘Submit A Ticket’ and select ‘IRC’ from the list of options available. File a bug with appropriate information for ‘Subject’, ‘Priority’ and ‘Freenode Nickname’ and provide some other relevant information in the text field. Once this ticket is closed by KDE sysadmin, which might take 1-2 days, you will receive a login id and password through email. Open https://bnc.kde.org:7778/ and login using the above login id and password. In ‘Your Settings’ you can configure your account which includes changing the password set by sysadmin, adding your Freenode network and then adding the channels you want to stay connected to. Once you are done with this you need to configure your IRC client. For Konversation which is the client I use for IRC, all you really need to do is follow the steps here: http://community.kde.org/Sysadmin/BNC#Settings_for_Konversation. However, do note that ‘yourusername’ == <your_kde_identity_username>/Freenode. That’s all that you need to do! Also this is the wiki page that talks about setting this up for other IRC clients: http://community.kde.org/Sysadmin/BNC. So go ahead and setup your IRC bouncer; and you can always see what happened on a channel even when you are not connected.